My Summer Cottage in Babylon: At least it wasn't Bob Saget. At least it wasn't Bob Saget. There's a quote in the movie Inception that says, "Dreams feel real while we're in them. It's only when we wake up that we realize something was actually strange." Yeah, I'll totally second that. I had a very pleasant dream last night. I was in luuuurve with a very nice man. I think in the dream we were vacationing around Italy. He was sweet and kind, and doted on me. There was a lot of hand holding and nuzzling. I woke up from the dream with lingering warm fuzzies. 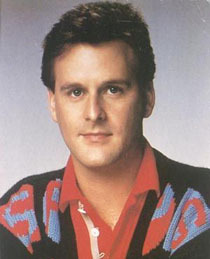 And then with a sick sort of shock I realized that the man of my dreams was Dave Coulier. I don't...I can't...I just...WHERE DID THAT COME FROM? I haven't seen Full House in years. Apparently my subconscious has been harboring a deep, secret love for Dave Coulier. Of all the late eighties/early nineties TV stars, why Uncle Joey? Kirk Cameron, I'd understand. I thought dirty thoughts about him all through middle school. Wil Wheaton? That would make sense, too. I think dirty thoughts about him even now. But Dave Coulier? That just disturbs me. I'm afraid to go to sleep tonight. Who knows who else is hiding in there? Subconscious, if you're listening, could you please make me dream about Johnny Depp tonight? Thanks. I love you guys. For realsies. Putting mysef in the corner. Give a little bit of your heart to me.